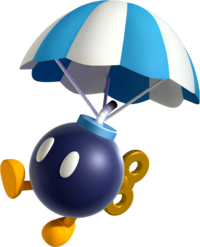 Parabombs (occasionally parsed Para-bomb or Para Bombs) are Bob-ombs with parachutes that appear in several Mario games. They descend slowly from the sky, and once they land, they act like normal Bob-ombs. 1.1.2 Super Mario 64 DS / New Super Mario Bros. They make their first appearance in Super Mario World, where they descend from the sky and once on land act like normal Bob-ombs. Super Mario 64 DS / New Super Mario Bros. In New Super Mario Bros. and Super Mario 64 DS, there is a minigame called Bob-omb Squad where Parabombs must be blown-up before they hit guarded flowers. In New Super Mario Bros. Wii, Parabombs first appear in World 8-5, where they are one of the many hazards alongside Crowbers and lava geysers that Mario must be careful of. They act identical to their Super Mario World counterparts. Para-bombs reappear in New Super Mario Bros. 2, having the same function as in earlier games. They are occasionally shot out of cannons. They appear only in World 2-B and World 6-2. Parabombs reappear in New Super Mario Bros. U, acting the same as in previous games. Their only appearance is in Red-Hot Elevator Ride. In New Super Luigi U, Parabombs appear in Current Event and Bowser Jr. Showdown. In Hotel Mario, Parabombs could crash into enemies from above. They are similar to their counterparts from Super Mario World, except for the fact that they could follow Mario and Luigi while falling. If they hit a door, the door would close, making Mario and Luigi's task harder. Para Bombs appear as enemies in Yoshi's Safari. Parabombs made a brief cameo in Paper Mario: The Thousand-Year Door. When Mario and his partner were shot out of the cannon in the Fahr Outpost the hatch that held the Bob-ombs opened up and released the Bob-ombs. They came down slowly using red parachutes. Parabombs appear in Paper Mario: Sticker Star for the Nintendo 3DS. They are found in Goomba Fortress. The cannons that appear blast the Parabombs from the tower after a Goomba wakes up a sleeping group of Bob-ombs using a trumpet. Once they hit the ground, they attack like normal Bob-ombs. Many Parabombs actually miss the desired area and fall into what seems to be a bottomless pit. After Mario beats the Megasparkle Goomba, Parabombs don't appear anymore. At the rest stop in Bowser's Snow Fort's mine cart ride, Shiny Bob-ombs drop into battle in the form of a Parabomb. In Super Princess Peach, Parabombs behave much in the same way as in Super Mario World. There is also a variant of Parabomb named Glad Parabomb. In Mario & Luigi: Paper Jam, paper versions of Parabombs appear in the Cannonball Chuck minigame in the arcade. They are seen suspended in mid-air after Mario throws the cannonball with Luigi on it. If the cannonball hits a Parabomb, the minigame ends. Parabombs in the Bob-omb Squad minigame from New Super Mario Bros.
Parabomu Parabomb; officially romanized as "Para Bom"
In the NES version of Yoshi, regular Bob-ombs use Parabomb's Super Mario World sprite, but without the parachute. ↑ von Esmarch, Nick. 2012. New Super Mario Bros. 2 Prima Official Game Guide. Page 29. ↑ Yoshi's Safari instruction booklet, page 19. This page was last edited on April 5, 2019, at 21:27.